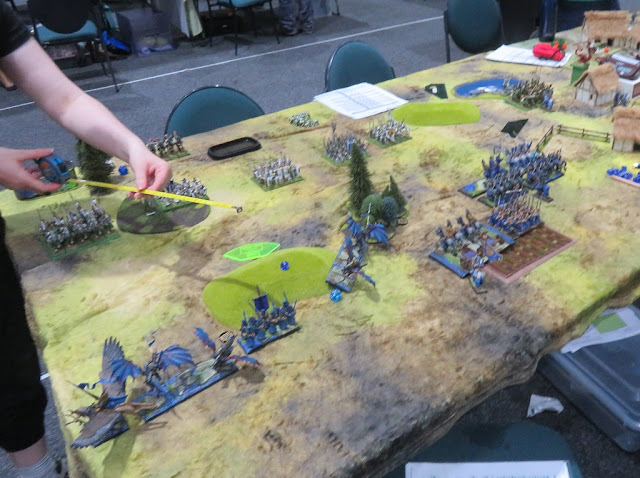 In the game 6 of the Australian Clash of Kings 2018 I played against another Elven army, commanded by Bridget who attended her first tournament! I must say that I find it very intriguing that since I have started playing Kings of War I have yet to play against the same army twice. What I mean is that unless I play against the same player who decided to bring the same army list again, all the forces I fought against have different compositions. It is truly fantastic, even after 2-3 years as it seems to show that KoW is very well designed game that allows for a huge variety. This army had a solid infantry core with two regiments of Tallspears and one regiment of Palace Guard. They are good, flexible units that can take some damage but still pin down the enemy and do some damage in return if supported by Bane Chant. The army also had good striking force in the form of two heavy cavalry regiments and the dragon. In addition, the range support provided by archers, silver breeze and lightning bolts can be very efficient if focused on a single target. However, what I noticed is that the army has only two sources of Inspiring Presence. While the majority of the units have good nerve, if they keep sustaining damage they would be easier to waver or even routed if not near the Dragon or Army Standard. I hope I would be able to use that to my advantage. It also seemed to me I have a slight advantage in speed with three flying units. 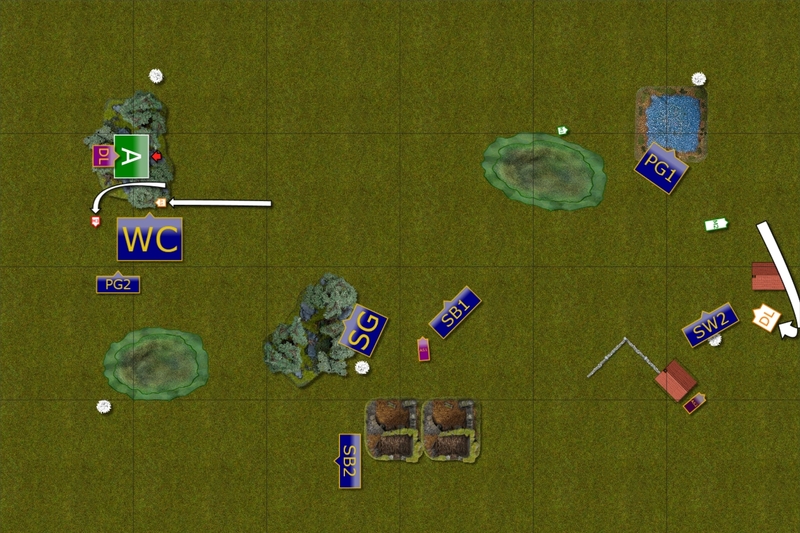 My shooters are more mobile too and in the case of Fast Cavalry, are not affected by movement. Thus my plan was to focus my own shooting against enemy Silver Breeze or Archers, whichever target would be available first. If enemy infantry is in the open I may use that opportunity to do some damage before inevitable melee. I also needed to lure the heavy cavalry in order to separate them from the infantry support. Or use my speed superiority to charge them first with the drakons. We played Scour scenario with 5 markers. I got the half with 3 markers on it so I decided it would be better for me to wait for the opposing forces, use my shooting concentrated in the center to eliminate some units before they would reach my lines and defend the flanks. 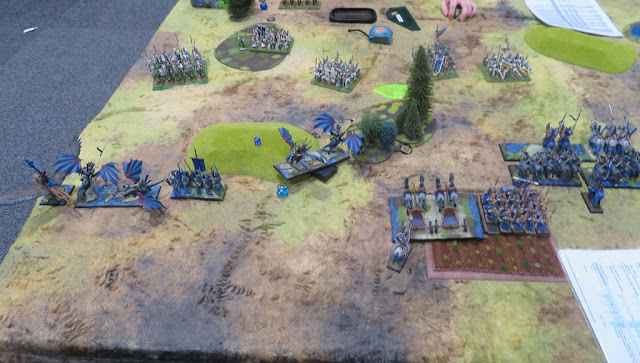 On the left flank I wanted to use my Drakons to intercept and eliminate Storm Wind cavalry as the infantry was a bit far to support them. However, I needed to do that before the enemy units would catch up with the knights. On the right flank the situation looked a bit more difficult due to the presence of the Dragon. That is why I positioned my own cavalry to support Palace Guard units. If the enemy went after my infantry the attacking units would expose flanks to my own knights. If they moved to face my heavy cavalry, they would be splitting the forces and potentially expose the flank to advancing Palace Guard. If that plan works I should be able to win left flank, stall right and punch some holes in the middle to help me to control at least 3 objectives and threaten either wing with the units from the center of the formation. Bridget won the roll off and decided to go first. 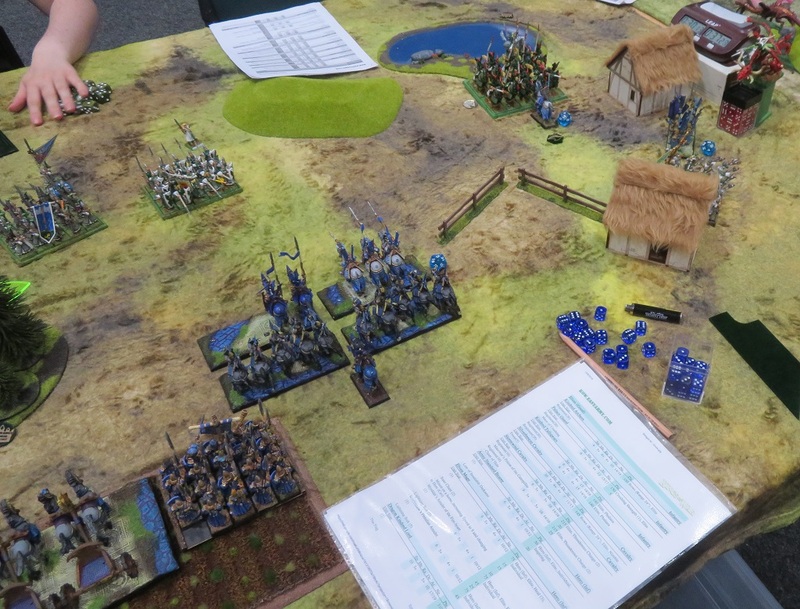 Elves advance towards their Kin. Elves advanced across entire battle line and opened fire at their Kin. However, due to movement and cover the opening salvo was not quite efficient yet. The Outcasts also advanced but each of the three groups had a different plan. On the left flank the Drakon Riders were moving into the charge distance against the heavy cavalry. 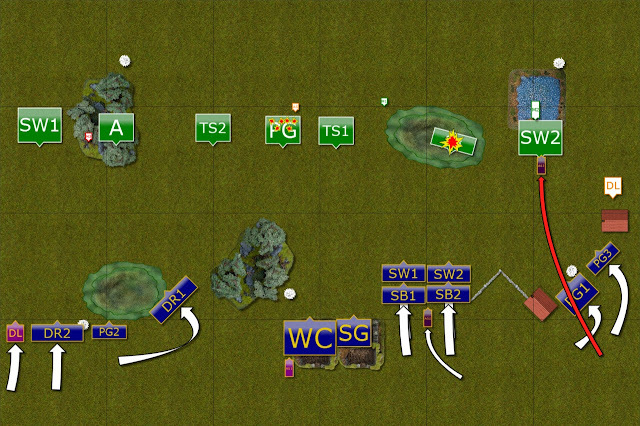 Units in the middle aimed at the Palace Guard and Silver Breeze that were in the open. Silver Breeze cavalry was routed as a consequence. 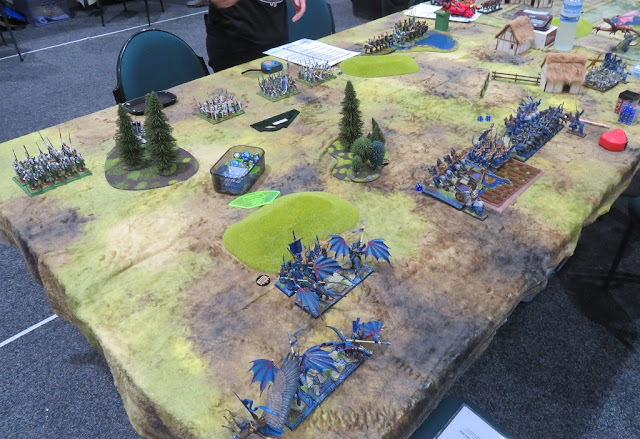 While Palace Guard units on the left moved into charging distance against heavy cavalry that was intercepted by the brave Army Standard! 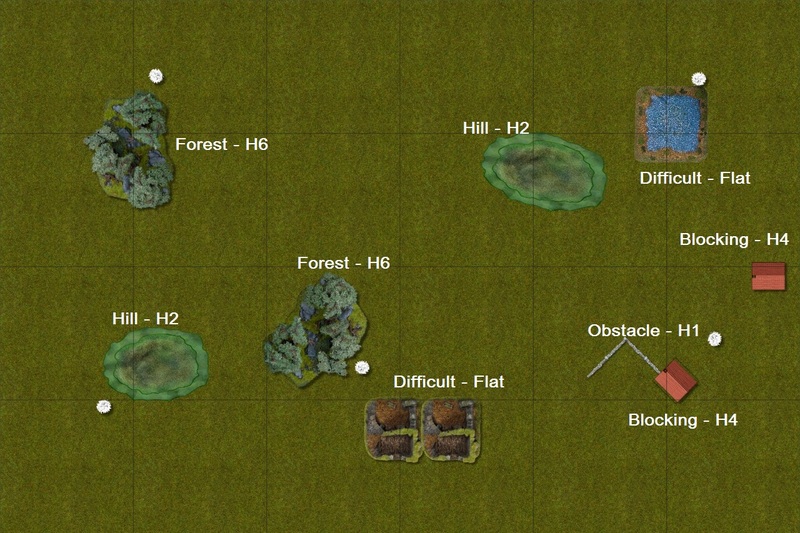 Left flank and the middle. Advancing towards the enemy continues. 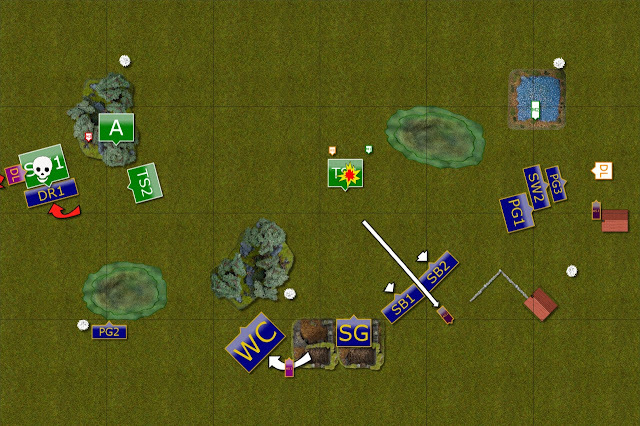 Elven units started responding to the moves of their enemies. 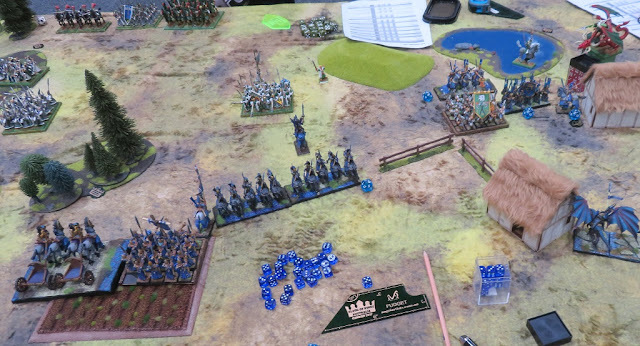 On the left Tallspears moved towards the Drakons to assist heavy cavalry while the Archers and the Mage aimed at them with their ranged attacks. 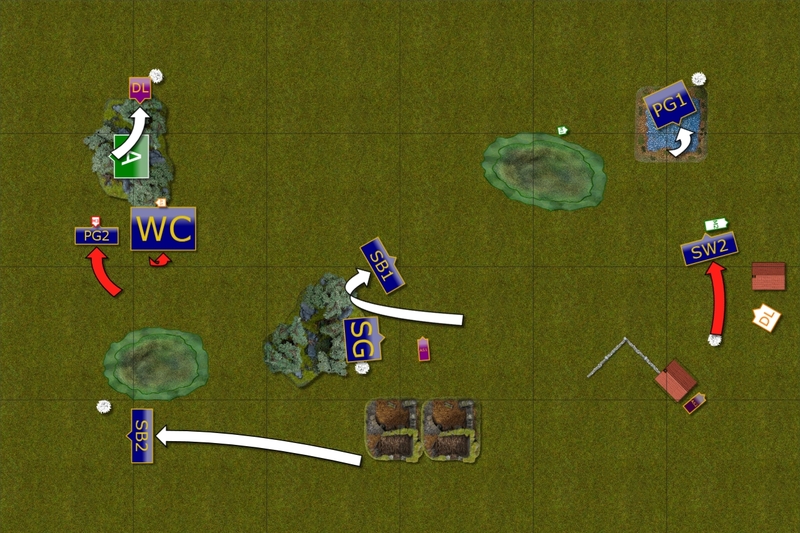 Palace Guard and Tallspears in the center closed ranks and kept advancing towards the enemy. At the same time, Storm Wind on the right flank attacked lone Army Standard but due to hindered charge they only managed to waver him! The Dragon used the opening for safe landing behind the enemy lines and focused on Palace Guard troops but these warriors held their ground. Drakon Riders charge Storm Wind cavalry. The Outcasts attacked their enemies first. On the left flank both Drakon Rider units intercepted Storm Wind cavalry but despite significant damage done they could not rout the knights. On the opposite flank the units were more successful as three of them could attack the heavy cavalry there and routed it. 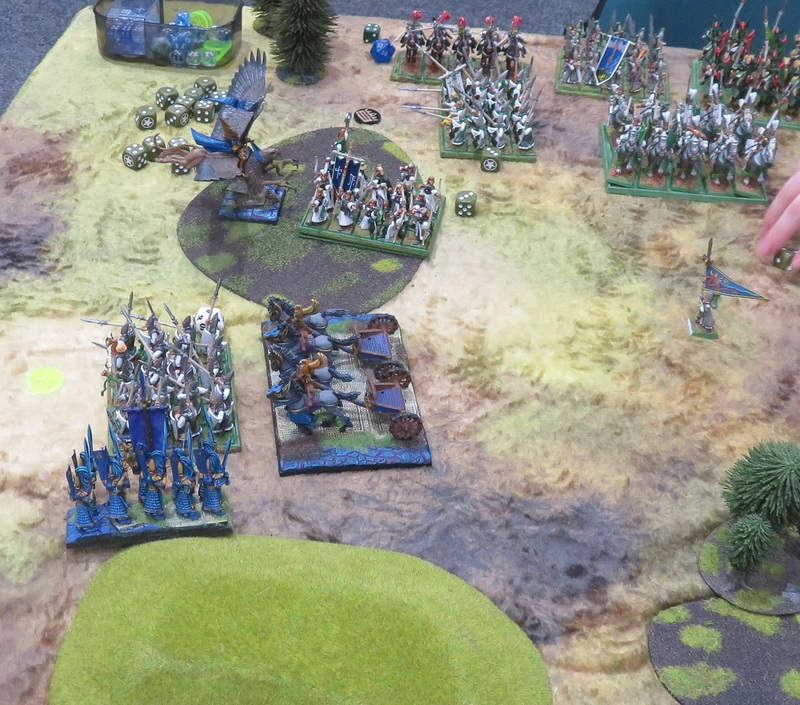 Storm Wind troops charged the phalanx of Tallspears to buy the shooters more time. That allowed them to rout Palace Guard regiment that this time could not shrug off the damage done. First units lost by the Outcasts. 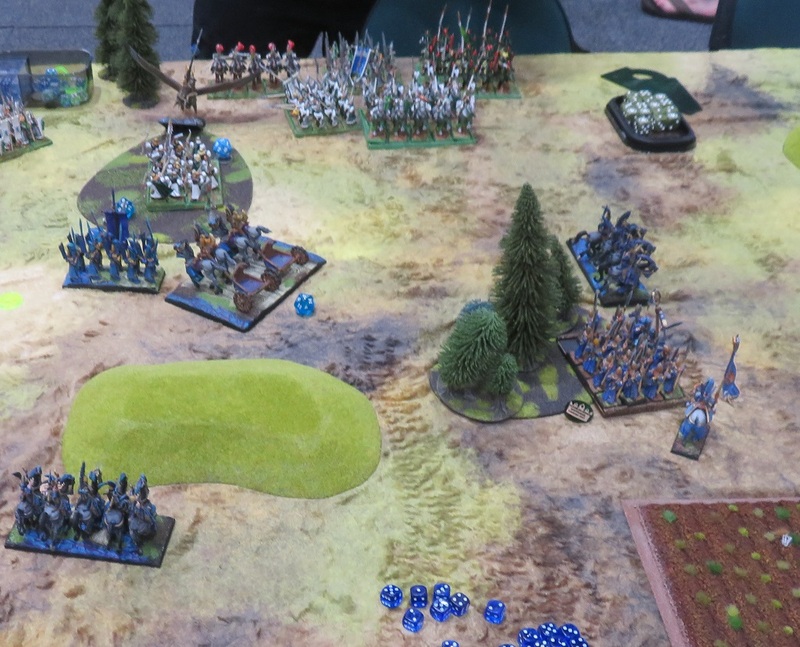 Despite losing some units Elves kept on fighting. 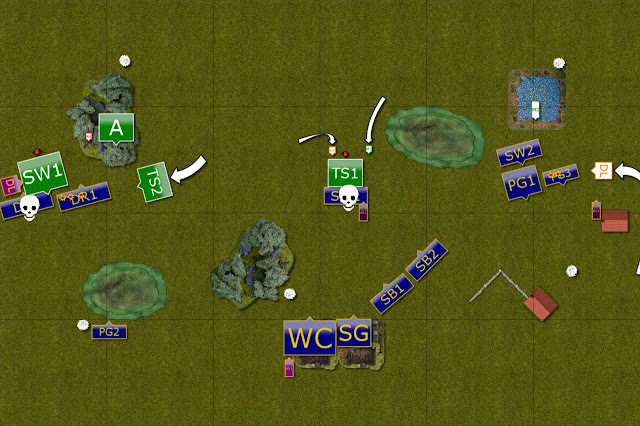 Storm Wind countercharged the Drakons and Archers with Mage shot at the other unit routing them (Edit: My apologies, I marked wrong unit as a casualty on the map). Also Tallspears got rid of the blocking knights but now had to face all shooting units of the enemy. On the right flank the Dragon continued hopping around and breathing fire on the enemies but somehow they did not want to flee! Two more units are routed. The Drakons continued their attack and this time enemy knights were routed. In the center, the shooters inflicted substantial casualties against Tallspears and isolated infantry unit also lost heart to fight. Second unit of Drakon Riders is gone! 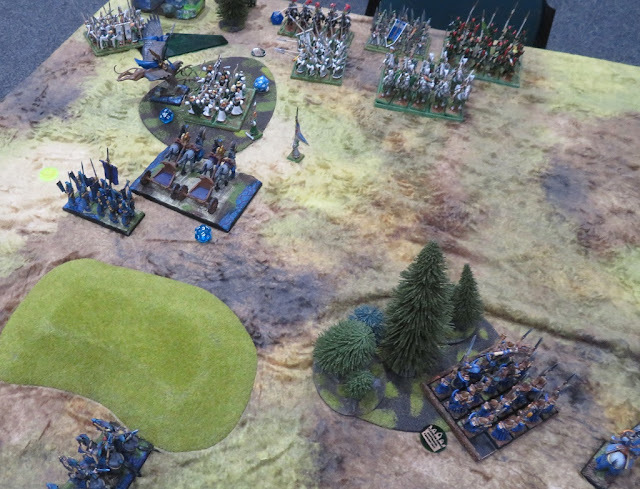 Brave Tallspears on the left flank were now in position to attack the Drakon Riders and their attack hit hard enough to rout another enemy flying cavalry! 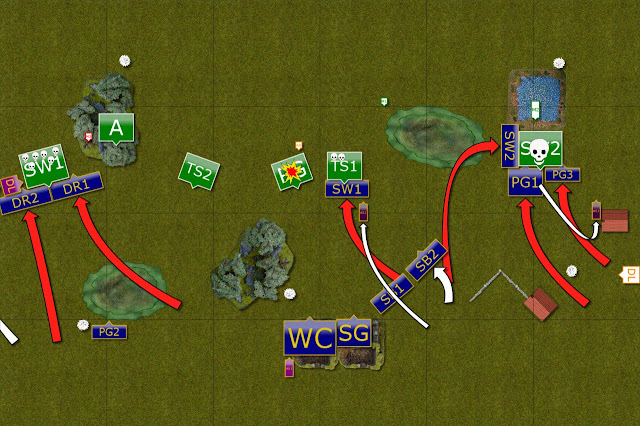 Close up on the situation on the left flank. With Drakon Riders gone the Outcasts sent in the reinforcements. 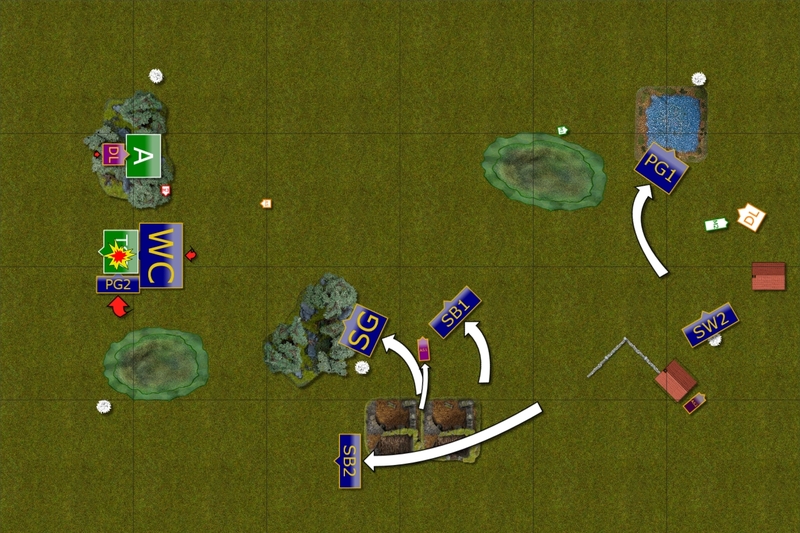 War Chariots surprised enemy Tallspears and attacked through the forest. However, the unit held its ground! At the same time the Drakon Lord distracted the Archers so that they would not be shooting at any units. That allowed Palace Guard troops to advance in relative safety. 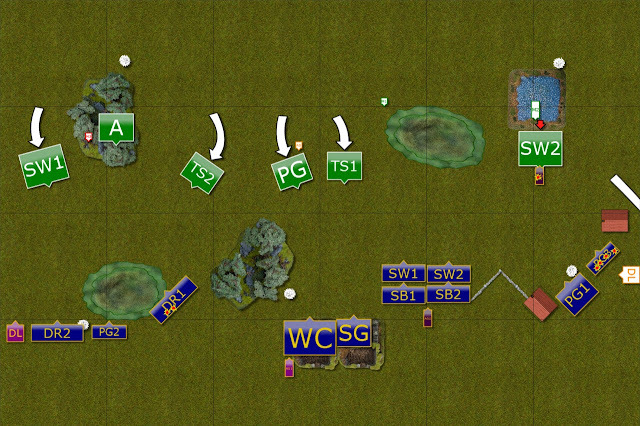 On the opposite flank the units dispersed, aiming to secure different objectives and to force the Dragon to choose one target. The Dragon finally routs a unit. With very few units left there were not many options for Elves to fight back. 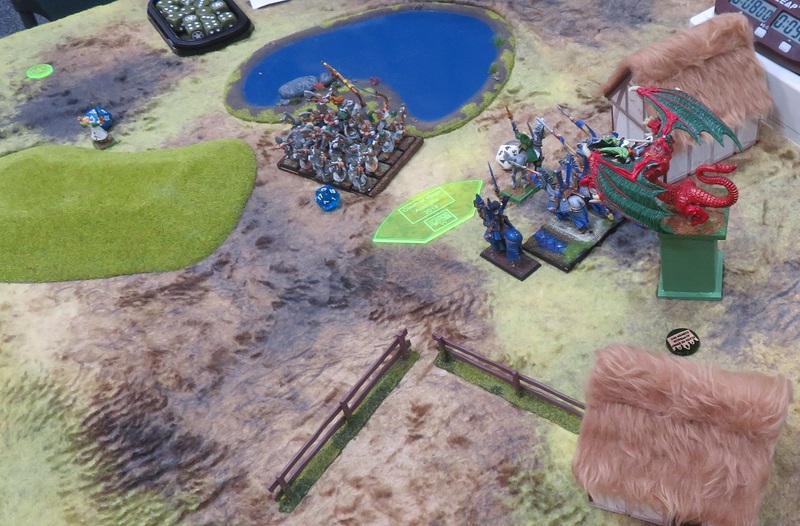 The Archers counter charged the Drakon Lord but did not do much damage. The Dragon, however, finally routed enemy unit. 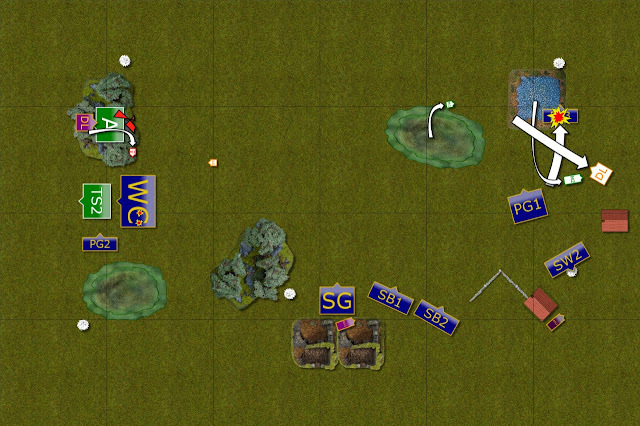 Slowly winning on the left flank. With no enemies in the center the units started maneuvering to support the left flank and capture as many objectives as possible. 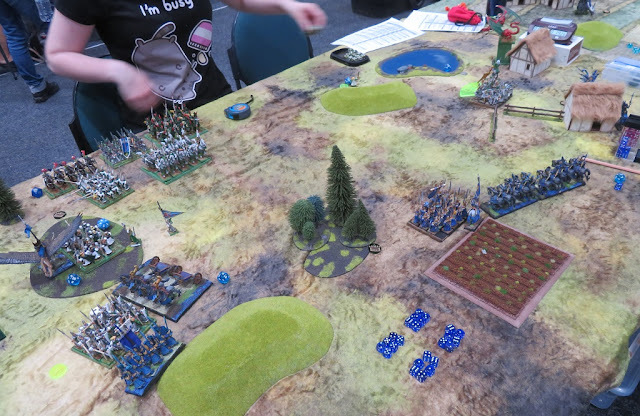 The War Chariots and Palace Guard finally routed enemy Tallspears while Drakon Lord kept fighting against the Archers. Elves moved their heroes to block enemy units so that the Archers could survive the battle. The Outcasts attempted to rout enemy heroes but otherwise focused on securing the objectives. After that the armies withdrew from the battle field as it was clear that this time the Outcasts got an upper hand. First of all I would like to thank Bridget for a game. I hope she enjoyed the battle regardless of the result and that the tournament was a great experience too! I am glad my plan worked this time as I was concerned if I can contain three fast and hard hitting units. I think what helped me achieve my goals was that Bridget spread her forces a bit too much and they units could not support each other. Good examples are both attacks on the cavalry where they were intercepted and had to counter alone. Also the shooting was divided among a few targets. 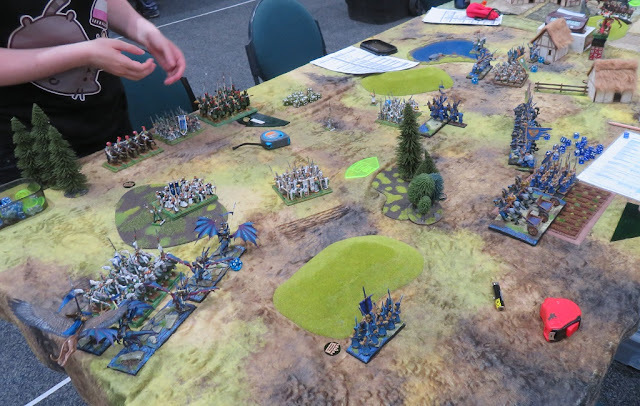 While on the left flank the Mage and the Archers hurt the Drakons, then the other Mage, Silver Breeze and Dragon were all after different units. Perhaps the Dragon was a bit unlucky but I am sure if the shooting was more focused I would have been in a bigger trouble. One of the things I wish I did better was the way I reacted to the movement of the Dragon. I simply kept turning to face it a few times that did not bring any effect. 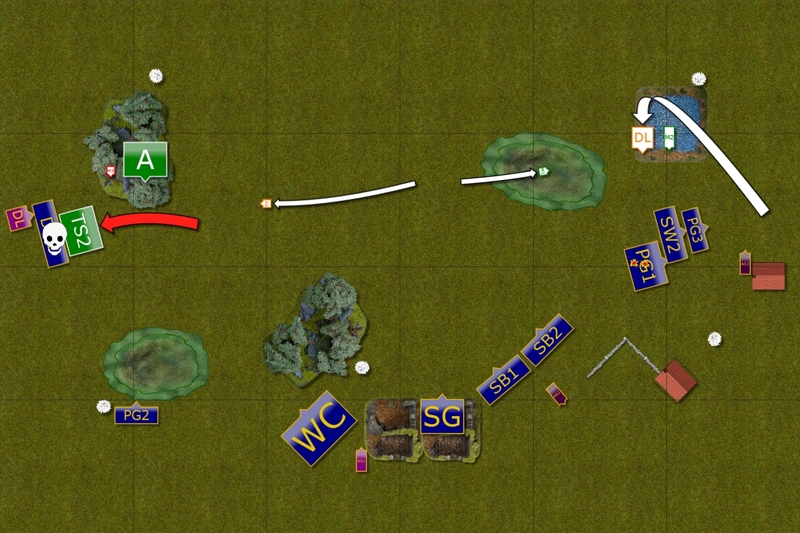 Perhaps I should have moved differently and try to tempt the dragon with some flank attack so that I could counter or at least prevent it from continuous landing behind my lines. I really enjoyed her list. The variety of units is something I place a lot of stock in. Versatility is very important because it always gives you options no matter the situation. I did think when I saw the deployment that she spread herself a bit thin. Also, leaving gaps like that can really expose yourself to flank charges from small footprint fliers (drakons, etc). She did position the dragon to great effect! Probably could have played more aggressively with it but that comes with practice. You had a plan and executed it which is what we always shoot for! Had any ideas on how to better deal with fliers? My new list lacks strong flier defense so any tips/tricks you figure out be sure to share! I think Bridget's army is good. It looks like a classic Elven force with Tallspears and heavy cavalry and a Dragon Lord! 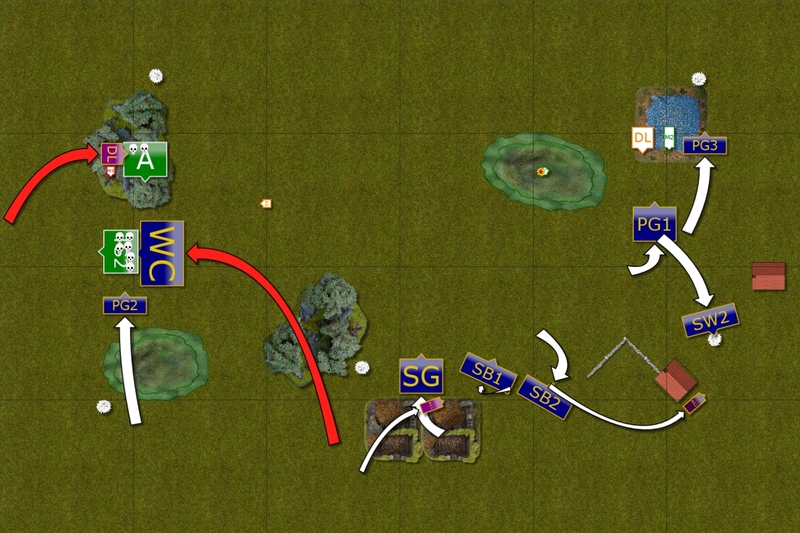 And it can be dangerous, just in this case it needed to have more tight formation and move the units in mutual support. She used the Dragon carefully and did not commit it to melee so it survived the battle. I don't think I would have had a chance to rout it with my three units there but who knows. Also, if it was damaged I had shooters to help. I don't have any super efficient and effective idea on how to deal with the fliers as it all depends on what exactly we are talking about and how many of the flying units you have to deal with. In my all games in this event I had to deal with at least one big flier of the size of a Dragon. If it was a single model it was obviously easier to deal with. 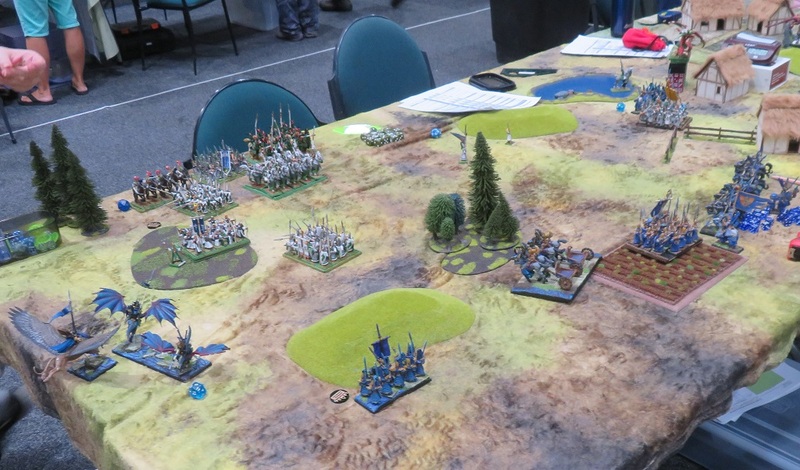 With many fast and tough units, as in the case of the game 2 against Mark and his double Dragon, double Drakons list it was far more challenging. For that reason I am currently considering upgrading Army Standards to Princes so I have a better chance to attack big flier and inflict that 1 point of damage to ground them.